It’s spring! We are all enjoying the beautiful weather, hiking, gardening and spending time outdoors. It is also the time of year when poison ivy and poison oak are growing abundant and strong. The doctors at Family to Family have seen an increase in the past few weeks of patients with poison ivy rashes. We want to pass on some helpful treatment advice and dispel the common myth about “spreading” poison ivy. 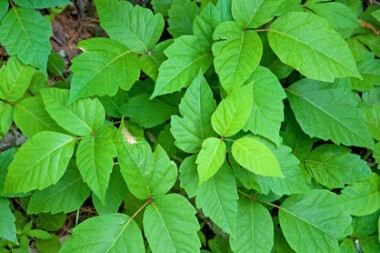 Poison ivy, sumac and oak secrete a toxin called urushiol oil. When human skin contacts this oil from the leaves, stems or any part of the plant (dead or alive), it sets up an allergic reaction that causes itchy rashes, blisters, and lesions. The oil can get on your pets, tools, gloves, clothing, shoes, and bedding. Clean any outdoor tools that may have contacted the plants. Wash the clothes and gloves that you wore when exposed. Don’t burn these plants! The smoke can blister your lungs! If you must handle these plants, wear protective gloves, long sleeves and pants, and wash thoroughly when you are done. If you know you have just been in Poison Oak or Ivy, try washing with Jewelweed soap, Tecnu Oak-n-Ivy Cleanser, or using Rubbing Alcohol to get rid of the oils you may have on your skin. Homeopathic Rhustox and Apis may also be helpful. There is also a medication called Zanfel, which binds to the oil and carries the oil with it when the Zanfel is washed off. This helps prevent spreading the oil to family members. Once the rash appears (which is usually 2-3 days after exposure), you can help to dry up the rash and soothe the itch by using a Jewelweed wash or putting 1 cup of oatmeal in your bath water (you can put the uncooked oats in a sock tied with a knot). Calamine lotion is one of the most effective topical creams available for the itch. If your rash has developed into a moderate or severe case, you should contact us for stronger remedies and possibly steroids. Fact: Poison ivy is not contagious, nor can it be spread once the rash appears. You can, however, catch it from gardening tools, clothing, or animals that still have the oil on their surface. Once you have been exposed to the plant and the oils are washed from your skin, you cannot spread the rash. It will seem so because the rash will gradually come out at different times on your skin depending on how much oil your skin was exposed to initially.